Reconnect is delivered in Murray Bridge, Mid Murray, Karoonda, East Murray, Southern Mallee and the Coorong from ac.care's Murray Bridge office. The aim of this program is to prevent homelessness and reduce its impact, particularly on families and young people, through innovative prevention and early intervention initiatives. 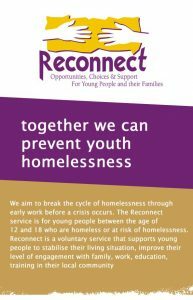 Reconnect is a community based early intervention program for young people aged 12 to 18 years who are homeless or at risk of homelessness and their families. It aims to help young people achieve family reconciliation and improve their level of engagement with work, education, training and the community. participation of culturally and linguistically diverse and Aboriginal and Torres Strait Islander communities.